crossie’s note: The Gaylord variant is listed at $4.99. crossie’s note: This is just a badly written solicit. But the accidental fleas/flees pun which I swear I did not add is just adorable. crossie’s note: I heavily edited this solicit because it was just riddled with typos and stupid little mistakes. It’s just embarrassing, actually. “Princess Bubblegum only wants what is best for her kingdom … most of the time. After an experiment of hers goes wrong, Ooo is under attack and this time, Finn and Jake won’t be able to help. Princess Bubblegum must stand up and fight her own creation, but with the help of Marceline and … Lemongrab? It shouldn’t be too hard to save the day, right? Don’t miss these brand new adventures by acclaimed cartoonist Ryan North (Dinosaur Comics) and drawn by our favorite art team in all ages comics, Shelli Paroline and Braden Lamb (The Midas Flesh). crossie’s note: Like last month’s Blacksad and Usagi Yojimbo hardcovers, technically not a September release, so I’d normally skip it, but too important not to mention. crossie’s note: Don’t never do that again. crossie’s note: Seems to be a lot of not furry Marvel comics with furry guest stars this month. Also, asterisks. crossie’s note: Whether or not Lockjaw is anthropomorphic or not is actually just as likely to be debated outside of furry than in. “There’s a new scourge sweeping the streets of the big city – robo-crime! Eric needs to know he can trust Woody – and that means Woody needs to get a job, open a bank account, sign up for a library card and do all the things a responsible adult does. But when a new gang of rogue mad-scientist super-criminals launch a wave of robot-enabled mega-crimes, will Woody stop them … or join them? Plus: the return of Edison’s Radical Acquisitions and the thrilling secret origin of … the one and only Goat! Collecting Quantum and Woody #9-12 and Quantum and Woody: The Goat #0, the world’s worst superhero team unleashes a volatile new batch of high-stakes hijinks right here with an all-new collection of adventures from awarding-winning writer James Asmus (Thief of Thieves) and acclaimed artists Tom Fowler (Hulk: Season One), Kano (Gotham Central) and Wilfredo Torres (The Shadow: Year One). crossie’s note: Well, that a wrap. Until next time, let the ponies hit the floor. 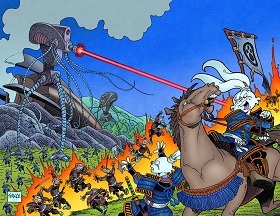 Remember when Usagi Yojimbo prided itself (ghosts and goblins aside) on being based, however loosely, on real Japanese history? How Miyamoto Usagi surviving the Battle of Adachigahara was based on the real-life Miyamoto Musashi surviving the real-life Battle of Sekigahara, and so on? War of the freakin' Worlds?! Stan Sakai's really lost it. I think he made it clear in an earlier interview I read that this very much not canon with the rest of Usagi Yojimbo. So this is an "imaginary story," though, as Alan Moore pointed out, aren't they all?